Luton boss Nathan Jones is not worried by his relatively quiet summer in the transfer window so far. The Hatters chief made his third signing of the close season by capturing Barnsley defender Matty Pearson on a three year deal for an undisclosed fee yesterday. We realise that it’s not as easy a process because we are trying to get top-end players for the level. Pearson joins Plymouth centre half Sonny Bradley and Birminghan’s Andrew Shinnie in putting pen to paper, with the latter on loan at Kenilworth Road last term. 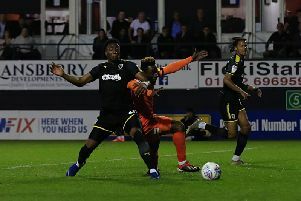 However, Jones knows that bringing in the type of player he wants will take time now that Luton are in League One, as he said: “The trouble is with such a strong squad we have, to improve on it takes real good players who are better than ours. “We have to identify those, but then getting players out of their clubs is difficult, and we realise that it’s not as easy a process because we are trying to get top-end players for the level.